Make a lighting path in the garden using this simple Solar LED light. It automatically turns on in the evening and gives light in the garden. LED light turns off in the morning. You can select any colour LED like Green, White or Yellow as per the choice. You can make this Solar light using only a few components. You need a 3 V Solar panel, two 1.5 V Rechargeable Pen cells and few other components. 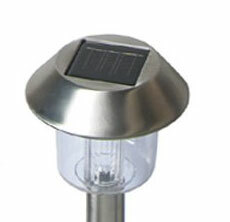 It is a miniature Portable Solar light that can be placed anywhere like garden, porch or even in an outing place. During day time battery charges from Solar panel and at Sunset, White LED turns on for around 6 hours.